We recently finished a five week wine and cheese class at our local Hy Vee store. What a great way to learn about wine and cheese. It's so interesting to see how tasting the wines and cheese together enhances the flavors of one or both of them. During the class on "The Kings of Cheese" we tasted one called Grana Padana. Not only did I love the flavor, what a fun name!!! I bought a piece and was looking for a recipe to use it in when I ran across this recipe. Perfect, I also just happened to have a Meyer Lemon from my plant that needed to be used. 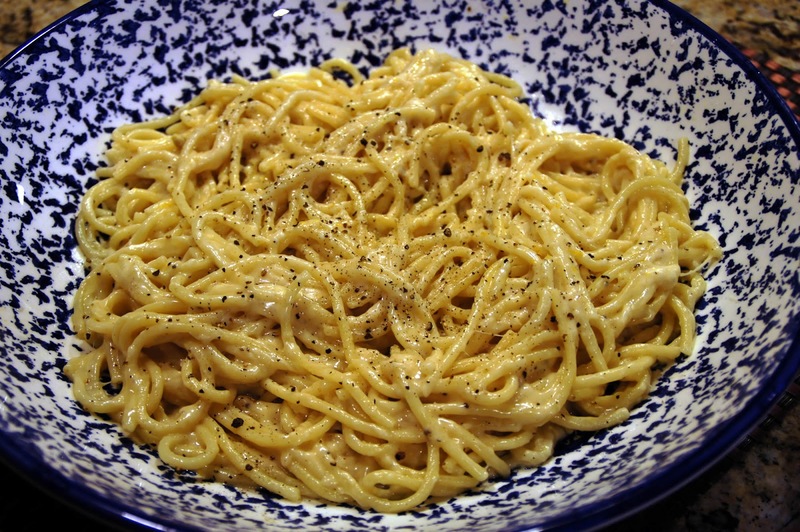 Cacio means cheese and pepe, pepper. For those of you who enjoy a simple yet delicious pasta, this is for you! If you're looking for a pasta recipe that is easy yet elegant enough for a dinner party, give this one a try. We'll be having this one again, soon!!!! Bring a large pot of generously salted water to a boil. Add pasta, and cook until very al dente, about 2 minutes less than called for in package instructions. Reserve 1 cup pasta water before draining. Transfer pasta to a 12-inch skillet (preferably nonstick). Add butter and 1/2 cup pasta water. Bring to a simmer over medium-high heat. The heat helps the starch in the water meld with the fat from the butter, which prevents the Grana Padano from becoming stringy in the finished dish. 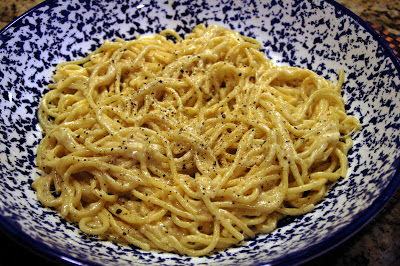 Reduce heat to low, and mix in Grana Padano and cracked pepper. Grana Padano is softer than Pecorino Romano; it will melt into the buttery water, creating a sauce as the pasta finishes cooking. Toss pasta with tongs to thoroughly coat it with sauce. Keep everything at a gentle simmer just until cheese melts and sauce thickens slightly, about 1 minute. Remove from heat, then stir in Pecorino Romano. (Always add Pecorino off direct heat; it clumps when cooked.) Zest lemon over the pasta. Any type of lemon will do, but a Meyer is particularly nice in this dish: It's sweeter in flavor and aroma, with back notes of orange and lime. If pasta looks dry, toss it with a bit more pasta water until it has a glossy coating. Divide between 2 warm bowls. Drizzle each with oil and lemon juice, and garnish with more cracked pepper. Serve immediately. I am linking this to On The Menu Monday and Miz Helen's Full Plate Thursday!! I have never made this, but I have been hearing such wonderful things about it I need to make it. This sounds so simple and delicious! Thanks for the recipe! I just read about Grana Padano in a Fine Cooking. Pinning your recipe and making it soon. I'm having a food party and I would love if you would bring this dish by... my blog is about simple living and the Mediterranean diet and this just they type of dish I love. I lvoe pasta without the red sauce. This looks delicious . I just started following you and would love a follow back at www.glutenfreematters.com .. I've about this recipe but haven't tried it yet - i don't know why. It sounds so good ! Oh my goodness! This recipe sounds amazing! Pinning!